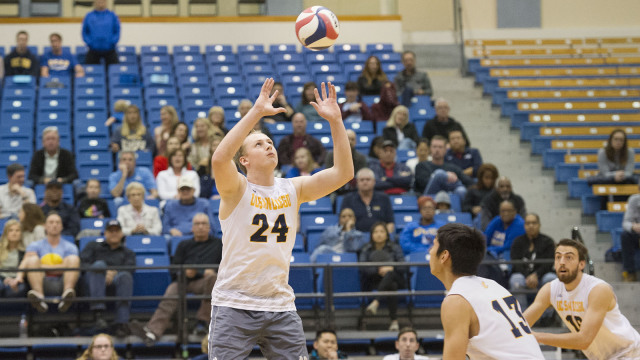 This weekend, the UC San Diego men’s volleyball team lost back-to-back away games in the Chicago area. The Tritons were swept 3–0 by the Lewis University Flyers on Friday, Jan. 18 and were swept again by Loyola University Chicago on Saturday, Jan. 19. Coming into their matchups with the Tritons, Lewis and Loyola were ranked eigth and ninth in the nation, respectively. From the onset, it was clear UCSD was overmatched. To start the first set, Lewis went on a scoring spree, scoring 6 unanswered points to go up 6–0. From then on, the Flyers drove up the score and the Tritons were unable to catch up. Lewis took the first set, winning 25–19. The second set started off better. UCSD scored 2 points early on to give it a 2–0 lead. However, this lead would be the first and only lead the Tritons ever had in this match. The Flyers quickly regained control, ultimately winning the set 25–11. In the final set, Lewis dominated the Tritons 25–12 to win the game. The second game against Loyola Chicago played out in a similar manner. Though the Tritons were able to put up a bit of a fight in the first set, losing just 20–25, the Ramblers were able to steamroll the Tritons in the next 2 sets — 15–25 and 16–25, respectively — to win the match. Despite matching Loyola’s 87 attack attempts, UCSD was unable to translate its attempted attacks into points. Only 12.6 percent of attempts were converted to points, compared to Loyola’s 28.7 percent conversion rate. Despite the losses, the UCSD players were able to put together some nice individual performances over the MLK day weekend. Sophomore outside hitter Wyatt Harrison was an offensive stand-out in both games. He lead the team on offense, compiling 51 attempts and 14 kills. Junior libero Ryan Lew had a solid defensive outing. Patrolling the backend, Lew recorded 9 digs in both matches. After winning both of their matchups last weekend against Harvard University and Sacred Heart University, the Tritons came back to earth, ending this week with 2 losses. With those losses, UCSD drops to an overall record of 2–4. Next weekend, the Tritons will square off against UCLA on Jan. 25 at the RIMAC Arena in the Triton’s first home game of the season. The last time UCSD went up against UCLA was four weeks ago in the second game of the 2019 regular season. In that outing, UCSD narrowly escaped being swept, losing 3–1. This game will also be nationally broadcast on ESPN3. The Tritons should hope to put this week’s losses behind them and put up a strong performance in the national spotlight.